Double-Sided Desk Sign Can Show Off Your Name Or Significant Message. It Does Not Need A Holder. Instead, Its Easel Style Sets Up Easily On Your Desk. Choose From More Than 35 Fonts And More Than 30 Plastic Insert Colors. Frame Is Silver-Colored. 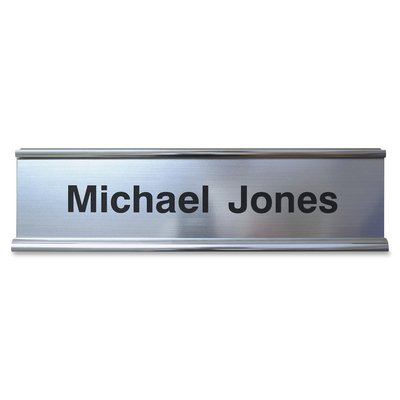 Contact Customer Service To Customize Your Anodized Aluminum, 2" X 8" Sign..
Double-Sided Desk Sign Can Show Off Your Name Or Significant Message. It Does Not Need A Holder. Instead, Its Easel Style Sets Up Easily On Your Desk. Choose From More Than 35 Fonts And More Than 30 Plastic Insert Colors. Frame Is Silver-Colored. Contact Customer Service To Customize Your Anodized Aluminum, 2" X 8" Sign.